Categories in WordPress can be excluded either manually specifying category id in the Feed URL to exclude, it which can lead to SEO unfriendly URL formats or difficult to manage if there are many categories.Here’s a way you can exclude specific categories from your RSS Feed without the need for editing the FEED URL. and add this piece of code in it. Replace $query->set(‘cat’,’-20,-21,-22′); with $query->set(‘cat’,’20’); that’s just removing the “-” and placing the only category id of which you want the RSS Feed to display. You can replace the numeric’s in the 3rd line with the category id you want to exclude.Do not forget placing the “-“ Minus Sign before the value to exclude them from the RSS Feeds. 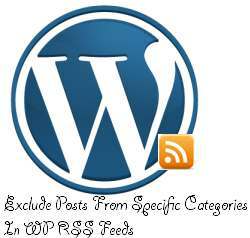 This function will strip the categories you define out of your RSS Feed without the need of adjusting your url. Send Private Messages To Other Users In WP MU Setup From WP Dashboard Using Private Messages For WordPress Plugin.